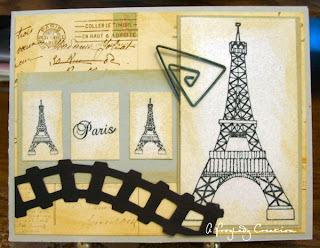 Stampers Quest January Sketch was a nice one to work with this image from FCD and some cool Making Memories Travel paper I found that had a Paris cancellation on it. So I layered, sponged ink, added a page pebble, added a train tracks die cut piece I found to the top of it and it all came together really well. I love the well worn travel look. Paris is awesome! I love this card!!! Great job!! You've done a fabulous job with this sketch - awesome!